This document provides links to articles and resources relating to “The Lens” by Cecil Balmond – a proposed Iowa City Public Art installation in the Black Hawk Mini Park. 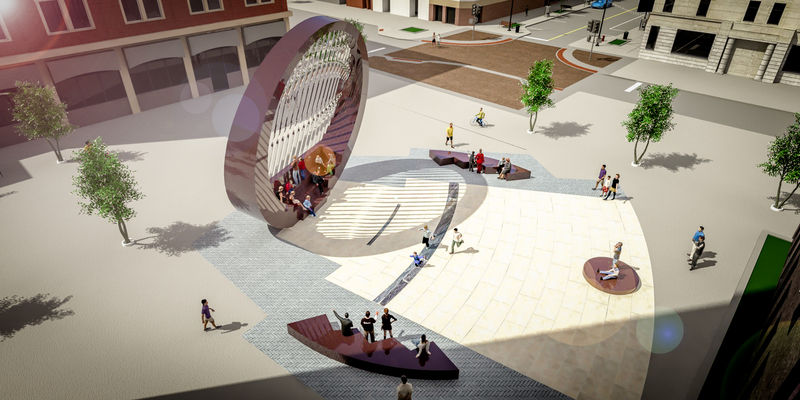 “Designs for 30-foot-tall public art revealed for ped mall,” Press-Citizen, Zach Berg, 2 Oct 2015 @ 3:38 PM. 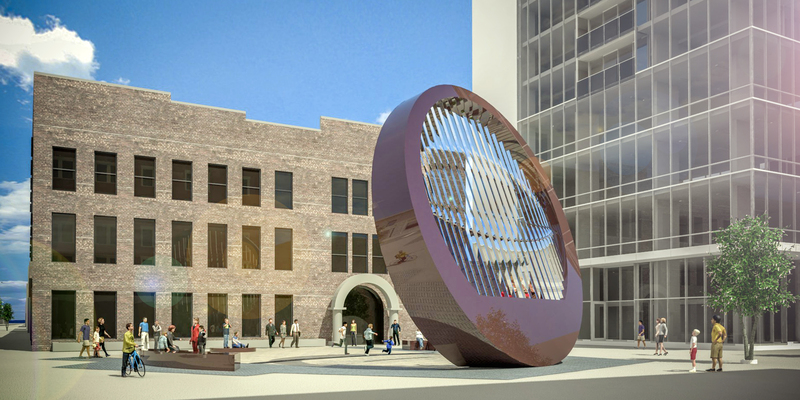 “Ped mall art piece has $500,000 price tag,” Press-Citizen, Josh O’Leary, 6 Oct 2015 @ 6:04 PM. “Balmond’s ‘lens’ to provide a new view of downtown,” Press-Citizen, 15 Oct 2015 @ 3:46 PM. “Future of ‘The Lens’ is clouded,” Press-Citizen, 5 Feb 2016 @ 6:42 PM. “Opinion: Public contribution to The Lens makes sense,” Little Village, Joe Younker, 25 Feb 2016. The update below is from the Iowa City Public Art Program web page as of 14 March 2016. In February 2015, the panel made a recommendation to City Council to select Cecil Balmond as the artist to develop the artwork concepts. Working with the Artist Selections Committee, City staff, Downtown District representatives and consultant Genus Landscape Architects, Dr. Balmond presented his design – The “Lens” to the public on October 1, 2015. A video of the presentation is below. 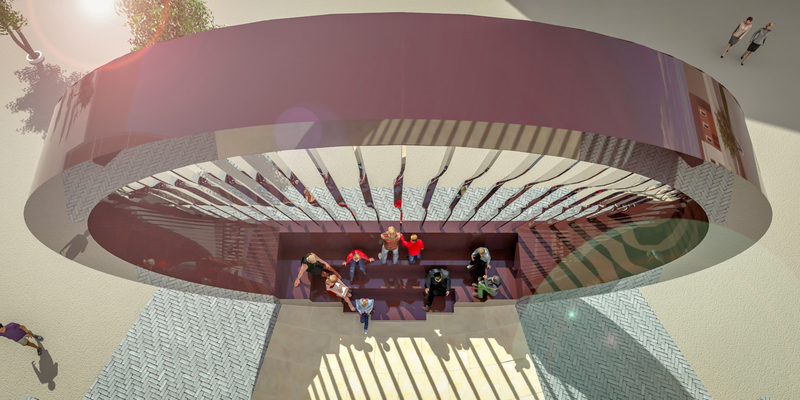 Balmond’s piece, “The Lens,” honors Black Hawk Mini Park’s significance as a communal space for formal and informal gathering, performance, and protest. A circular pattern of seating within the park creates an amphitheater setting complete with a rostrum for public speaking. Designed to be interactive and playful, the 30 foot circular disc with its center of twisting louvers functions like an opening and closing “eye”. Through its lens, the changing light of the day and seasons are captured and refracted onto the surrounding visitors and buildings. During the daylight hours, the sun’s rays throw shadows of the disc’s form, creating moving circles across the park’s paving stones. At night, an arc of colored light embedded in the disc projects onto the metal blades, reflecting outward. The animation of the louvers sliding geometry enhances a sense of theatre that is integral to the history and character of the Pedestrian Mall – a space that for many defines the Iowa City experience. 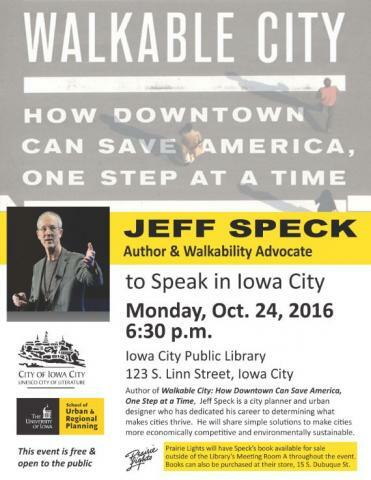 For more information, contact Marcia Bollinger, Iowa City Public Art Coordinator at 319-356-5237 or marcia-bollinger@iowa-city.org. Click any image below to view a very large (8331 x 4167 – 12MB) rendering of that image.